Soak the sooji and maida in water for about half an hour. Chop the vegetables finely - onion,tomato, chillies and capsicum. Add salt in the batter. If required add more water to the batter to get the desired pouring consistency. Pour a laddle full of batter.Sprinkle the vegetables over it. Let it cook on a medium flame till it gets light brown on the edges. 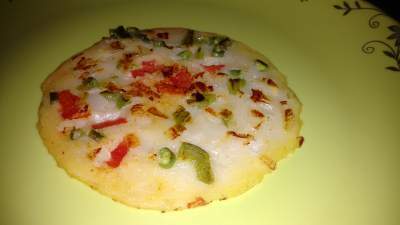 The cooking time is a little longer than a normal uttapam.